Government requests worldwide for user data related to search engine traffic on Google increased 29% from 2014 to 2015, according to the search site's most recent Transparency Report, which was published today. Google reports on the government requests every six months. In the second half of 2015, it said it received more than 40,000 requests for data related to more than 81,000 user accounts; That compares to the first half of the year when Google received about 35,000 requests related to about 69,000 accounts. 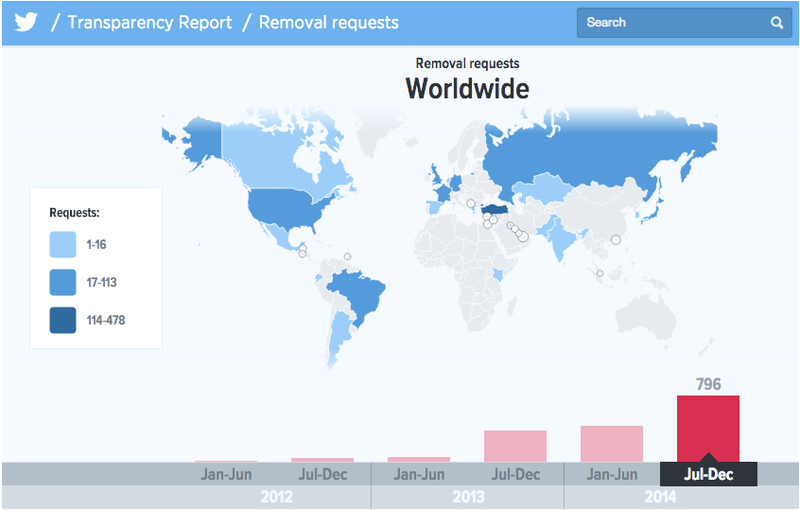 The number of requests from governments and courts around the world for Google to hand over user data. In the second half of 2014, Google received 31,140 requests from U.S. entities for user information related to more than 50,000 accounts. "Usage of our services [has] increased every year, and so have the user data request numbers," Google said. By far, the U.S. leads the world in government requests for data: it submitted 27,157 requests related to 12,523 user accounts in the second half of last year. The next highest country was Ireland with 12,114 requests, followed by Germany with 11,562 reqeusts. Google agreed to hand over "some" user data for 64% of the requests worldwide, but it handed over data for U.S. government requests 79% of the time. The percentage of requests where Google provided governments or courts some user data. Several search engines and social media sites voluntarily offer annual or semi-annual transparency reports related to state and federal law enforcement information requests about user data. The Electronic Frontier Foundation (EFF), an international non-profit digital rights organization, publishes a report on which Internet entities do the best at protecting subscriber data. AT&T and smartphone instant messaging app WhatsApp received the lowest ranking related to practices such as telling users about government data demands and being open about data retention policies. Each garnered just one star out of five related to protecting user data. Google received three out of five stars. Twitter received four out of five stars related to protecting user data from government requests and privacy transparency policies. "This is Google’s fifth year in the report, and it has adopted some of the policies we are highlighting, including the best practices from prior reports," the EFF stated in its Who Has Your Back? 2015 report. "Nonetheless, there is room for improvement. Google should take a stronger position in providing notice to users about government data requests after an emergency has ended or a gag has been lifted. Furthermore, Google should provide transparency into its data retention policies." In the second half of 2015, Microsoft also received more than 39,000 requests for information related to more than 64,000 user accounts. 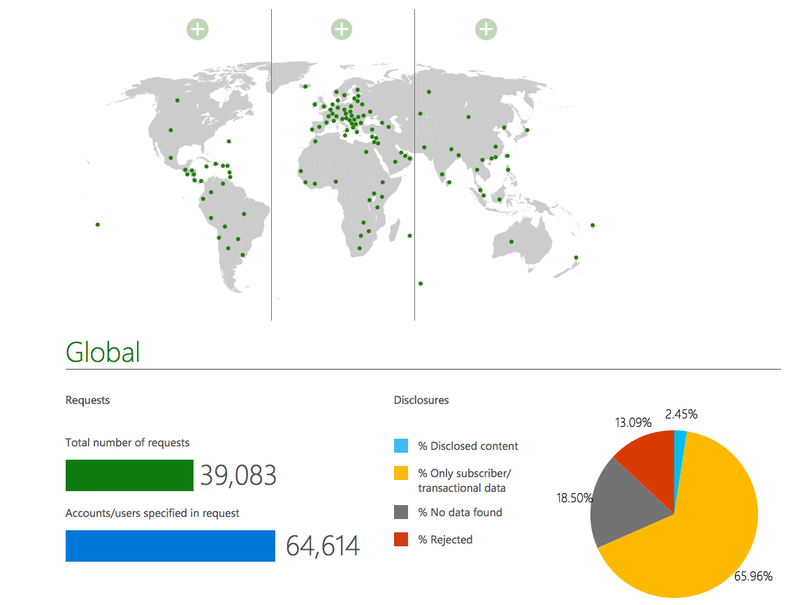 That compares with 34,000 requests in the second half of 2014. The total number of government or court requests for information from Microsoft related to user data in the second half of 2015. Microsoft said it disclosed subscriber and transactional data about 66% of the time, but it only disclosed actual search content 2.45% of the time. Microsoft outright rejected 13.9% of the requests for information. In 2014, the social news networking service Reddit issued its first transparency report, saying it received 55 requests for user information, including account registration data, log data and content uploaded by users from outside parties. Reddit agreed to hand over information for 58% of all government and civil requests, and 64% of all US state and federal government requests. Google has been publishing its semi-annual Transparency Report since 2011; the latest statistics show that requests for user data is at an all-time high. In 2014, Apple, Microsoft, and Google were among 10 top tech companies that signed a letter backing passage of the USA Freedom Act, which would curtail bulk collection of Internet metadata by government agencies. Passed in June 2015, the USA Freedom Act now requires transparency when the government demands user information from technology companies. Nevertheless, the EFF said there still needs to be more transparency when it comes to government-mandated back doors, as well as what deleted data is kept around in case government agents seek it in the future. "We think it’s time to expect more from Silicon Valley," the EFF said.